AU-ZBG10002 encoders with the length sensor conversion kits are used for precise speed control in Omega's manufacturing process for metal sheath thermocouple wire. The ZB Series shaft encoders are general duty industrial rotary pulse generators. The AU-ZBG models are for single channel sensing for counting, one directional measuring or speed applications. The AU-ZBH models are for quadrature applications, allowing for counting up and down along with speed and direction measurements. 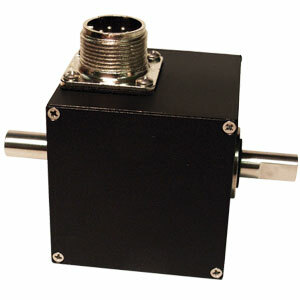 A conversion bracket is available to easily convert this encoder into a length measuring sensor. They can be direct-coupled to a machine shaft by means of a flexible-bellows, spring, or rubber sleeve type coupling that allows for axial and radial misalignment. They can also be coupled with light instrument timing-belts. Timing-belt drives also allow convenient gear-up or geardown speed ratio changes that can be useful for obtaining non-standard PPR rates. See SPECS above for full specifications and additional information on length sensor conversion kit.